David Lubinski, president of the International Society for Intelligence Research, presents UD's Linda Gottfredson with the ISIR Lifetime Achievement Award. 11:44 a.m., Feb. 25, 2014--For decades, Linda Gottfredson, professor in the University of Delaware’s School of Education, has explored multiple disciplines on the roots and real-world meaning of recurring human variation in intelligence. Gottfredson has contributed data-based answers to old puzzles, including why higher levels of intelligence enhance performance in school, jobs and virtually all of life domains; what in the human evolutionary environment could have ratcheted up such a non-specific, domain-general ability; and why equalizing access to health care increases health disparities rather than narrowing them. She has also contributed to professional practice, such as the detection of bias in police selection tests; trends in achievement gaps across jobs, tests and school subjects; and cognitive barriers to effectively self-managing a chronic illness. In recognition of her work, Gottfredson was presented with a Lifetime Achievement Award by the International Society for Intelligence Research (ISIR). ISIR is the focal scientific society for the world's researchers on human intelligence, publishing the leading journal in the field. The Lifetime Achievement Award is ISIR’s highest honor, reserved for individuals who have, over their professional lifetime, substantially advanced the science of intelligence. 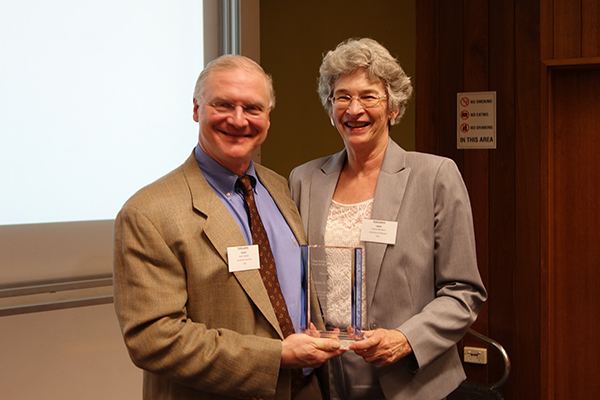 Gottfredson received the award at the annual ISIR conference in Australia on Dec. 12. She is the first woman to receive this award. Gottfredson has published extensively on the impact of general cognitive ability on social inequality and personal functioning in different life domains. Her research and policy analyses have appeared in scientific and general interest journals, including Current Directions in Psychological Science; Human Performance; Psychology, Public Policy and Law; Scientific American and Wilson Quarterly, as well as handbooks for educators and clinicians. Most recently, her work has focused on what makes some everyday tasks more complex and cognitively demanding than others, thereby putting less intellectually able, less literate individuals at greater risk of accidents, non-adherence to medical regimens, and failure to master the basic reading, writing and reasoning tasks of modern life. She is currently collaborating with diabetes educators to make effective self-care more cognitively accessible to at-risk diabetes patients. In her prolific career, Gottfredson has received awards from the American Psychological Association and the International Society for the Study of Individual Differences, and has been recognized for her “courageous public defense of student and faculty rights” by the Foundation for Individual Rights in Education.